The lecture on next Sunday, 3rd March 2013, 7 pm at the Mummification Museum will be on Ptolemaic coins in the Theban region. The speaker Thomas Faucher works for the programme ANR-Nomisma and the Institut français d’archéologie orientale (IFAO) in Karnak. His main field of research are coins of the hellenistic Egypt. Tree years ago, archeologists discovered a treasure of coins at the Ptolemaic public baths in front of the Amun Temple in Karnak. The hoard consists of 316 bronze coins from the 2nd century BC, bearing the heads of either Isis or Zeus Amun on the obverse, and one or two eagles on the reverse. On Sunday February 24, 2013, 7 pm Dr. Laurent Bavay will lecture at the Mummification Museum on the current excavations of the Belgian archaeologists of the Centre de Recherches de la Faculté de Philosophie et Lettres de l'Université Libre de Bruxelles. 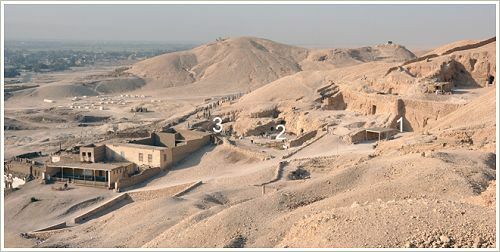 The mission works in the tombs of Sennefer (TT96 = 1 on the map below), Amenemope (TT29 = 2) and Amenhotep (TTC3 = 3) in Sheikh Abd el-Qurna. Recently, a granit stela from Amenhotep's tomb, which had been reused in the Temple of Khonsu at Karnak, had been brought back to its original location (we reported). That's why the lecture is entitled "Amenhotep is back on the hill". Also, the discovery of the tomb pyramid of Khay, which was announced yesterday, is due to the work of the Belgian mission. 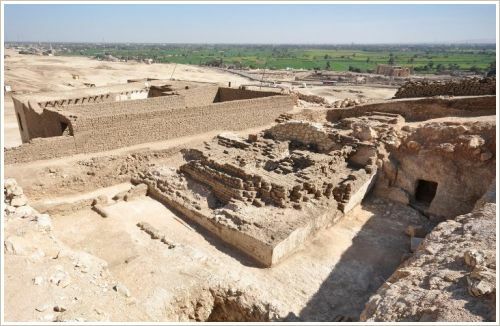 Yesterday, the Egyptian Minister for Antiquities announced that Belgian archaeologists of the Université Libre de Bruxelles (ULB) discovered the remains of a mud brick tomb pyramid opposite to the Ramesseum during their routine excavations at Sheikh Abd-el Qurna. The pyramid had a height of about 15 metres and a width of 12 metres. On its top there was a pyramidion with a depiction of the tomb owner Khay worshipping god Re-Horakhty. During the New Kingdom it was usual to build such pyramids above the tombs of high officials. The tomb itsself wasn't found yet. Khay started his career as the First Royal Herald of the Lord of the Two Lands. He was charged with reporting the affairs of Egypt. In his 26th year Ramses II appointed him as Vizier for Upper Egypt. In this capacity he supervised the works in the Valley of the Kings and the Valley of the Queens. He proclaimed the sed festivals of the king in year 30, 34, 37, 40, 42 und 45 of his reign. As already announced last week this morning the salvage operation for two Amenhotep III colossi started. 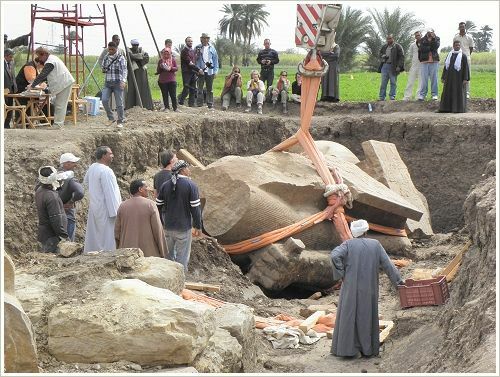 A joint Egyptian-European mission directed by Mohammed Abd el-Maqsoud and Hourig Sourouzian tried to lift the huge fragments of the statues out of their "bed" north-east of the Merenptah Temple. Just like the well-known Colossi of Memnon guarded the western gate of the Mortuary Temple of Amenhotep III (nowadays called Kom el-Hettan) these two 13-metre tall quartzite monoliths flanked the north gate - until they toppled down by an earthquake at about 1200 BC in south-east direction and broke into several pieces. Since then they remained lying there in privately owned land covered by sand and soil and were at risk of being finally destroyed by irrigation water. 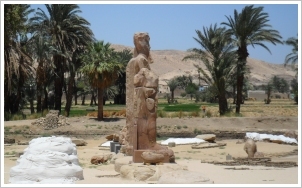 Since 1998 the Colossi of Memnon and Amenhotep III Temple Conservation Project" made all effort to save the statues. 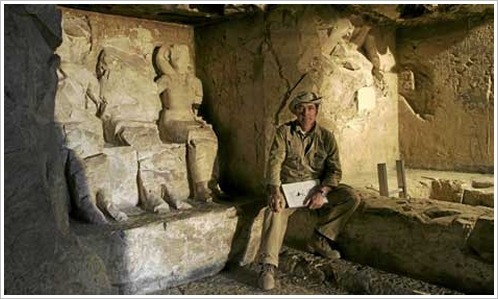 In 2010/2011 a team of the Ministry of Antiquities directed by Dr. Zahi Hawass, former Minister of Antiquities, had uncovered the statues in an attempt to raise them but the work had been interrupted on account of the Egyptian Revolution. Today, it was happening. The meanwhile unearthed fragments weighing tons were lifted out ofthe pit by a crane and brought to their new location further west by a low loader. There, the workers raised tem on a prepared bed of sand. Detailed photo report to follow soon! On Sunday February 17, 2013 Dr. José Manuel Galán will lecture at the Mummification Museum 7 pm. 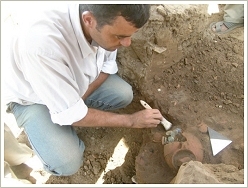 He is the field director of the Proyecto Djehuti in Dra Abu el-Naga (northern end of the Theban necropolis) and works in the tombs of Djehuti (TT11) and Hery (TT12). 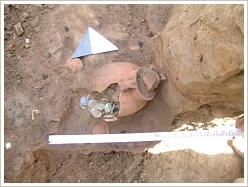 Frequently, the mission discovers remarkable finds (see our news from 22/06/11, 09/08/12 and last from 31/01/13). Actually, it's out of all reason that there are none in Egypt: houses that collect all needed energy for hot water, electricity and air-conditioning from the sun. It's even more incomprehensible in view of the regular blackouts across the country. In order to ease this situation students of the American University in Cairo developped a solar house prototype as a project for the Solar Decathlon China in August 2013 - if they find sponsors. Their project is called "SLIDE-S" (Sustainable Living Interactive Design). The involved 19 students were guided by traditional Arabic architecture in order to incorporate passive cooling and natural ventilation into the design. The building has a partially double-layered façade of interlocking perforated sections, which slide to regulate the amount of sun penetrates the interior of the home and allow wind circulation - like the traditional Mashrabiya screens. The international Solar Decathlon Energy Competition has been initiated by the U.S. Department of Energy. The Egyptian team will compete with Belgium, England, Sweden, Switzerland, Israel, China, the United States, Turkey, Iran, Australia, Malaysia and Singapore for the grand price for the most solar efficient, healthiest and most stylish dwelling. Although Egypt has one of the highest levels of solar irradiance across the globe only one percent of energy consumption is from renewable sources. For more innovative projects see our news from 31/08/11, 04/11/11, 05/11/11 and 13/04/12. 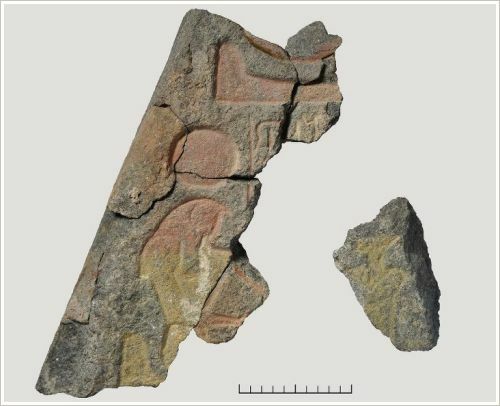 In recent years, the Mortuary Temple of Amenhotep III (Kom el-Hettan) hit the headlines with several spectacular finds (see our news from 02/03/10, 22/03/10, 17/05/10, 02/10/10, 16/12/10, 27/04/11, 31/05/11). 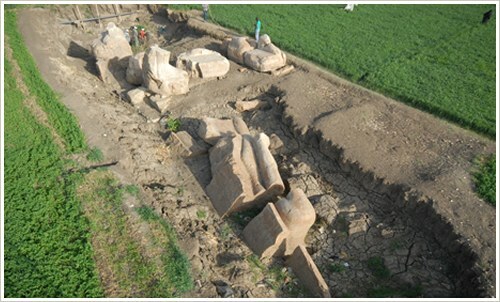 The resurrection of the 3rd Memnon Colossus was a highlight of last year (see our news from 18/02/12 und 04/03/12). Now, the 3rd pair of the Memnon Colossi, which originally guarded the northern gate of the temple, is threatened by water. In 1933, the two statues were discovered in situ - collapsed and broken in many pieces after an earthquake which occured in 27 BC. They fell into oblivion and were rediscvovered in 2010, embedded in the passageway leading to the third pylon of the temple. Recently, they were submerged by irrigation water of the surrounding farm land. Additionally, a water pipe exploded what made a quick intervention indispensable. Next Monday, the rescue pperation will start. Within one week, the colossi will be moved 60 metres away to a safe place. Subsequently, the more than 20 fragments of the 14-metre-high limestone statues will be restored and composed on their 4-metre-high bases at their original location. 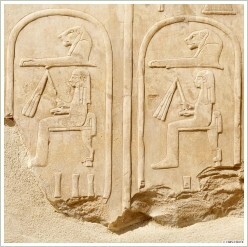 The limestone chapel Netery-menu was constructed at the Karnak Temple to worship Thebes ancient Egyptian god Amun-Re. It is other than the Red Chapel a chapel of Hatshepsut at the Open Air Museum. 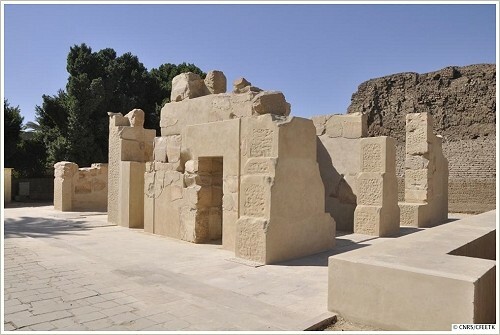 The reconstruction of the Netery-menu started in 2009 as a main programme of the Centre Franco-Égyptien d'Étude des Temples de Karnak (CFEETK) and was finished at the end of January 2013. It is located close to the entrance of the Open Air Museum and now ready to be opened to visitors at the end of February 2013. The building consists of an open courtyard and two inner halls. The walls of the 5.39 m high monument show figures of Hatshepsut, her husband Thutmosis II and their daughter Neferura as well as of her stepson Thutmosis III. The chapel's loose limestone blocks were first discovered by George Legrain at the beginning of the 20th century in the Cachette courtyard at Karnak, and then by Egyptian archaeologists in the mid-1950’s. This monument is of major importance for ancient Egyptian history since it is one of the few surviving records that attests explicitly to the power of queen Hatshepsut just before her ascendancy to the throne as king. 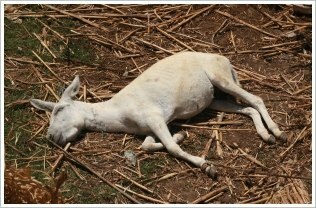 AWOL (Animal Welfare of Luxor) is an English animal welfare organisation based in Luxor and operating in the poor farming villages of El-Marise and Armant south of Luxor. 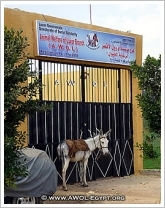 The new AWOL Medical Care Centre opened on 13th January 2013. Having spent many years helping people care for their animals, as well as getting to know so many families, we realise that it is not, for the most part, cruelty that we have to deal with, but the combination of a lack of understanding and outdated practices. We do all that we can to improve the lives of amongst others, the large number of dogs, horses and the extremely hard working donkeys, through preventative medical care, treatment and education. AWOL is making a real difference to the welfare of the animals in the villages that form the farming community of El Marise. As we grew we were able to expand to cover the neighbouring village of Armant. ... We welcome like minded people to join us both in Luxor and in the UK, to raise awareness and of course funds, as the more animals we treat, the more money we must raise in order to be able to pay for the medicines. AWOL helps the community and especially the children, grow with a better understanding for the animals that work so hard for them. For more than 40 years the 50 cm long eye of a colossal statue of Amenhotep III had vanished from his mortuary temple at Kom el-Hettan on Luxor's west bank. Last Sunday, on February 3, 2013 it returned to Luxor. In 1970, the Swiss mission working at the area of the mortuary temple unearthed a huge quartzit statue of the pharao. After a fire in 1972, which had badly damaged the statue, one of its eyes disappeared and turned up again at the Galerie Nefer in Zurich, which sold it to the Norbert Schimmel Collection in New York, which in turn auctioned it at Sotheby's. The Geman private collector who purchased the eye donated it to the Antikenmuseum Basel und Sammlung Ludwig where Hourig Sourouzian, Director of the "Colossi of Memnon and Amenhotep III Temple Conservation Project" recognised it and brought it to the attention of the SCA. 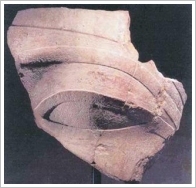 Since 2006 Egypt negotiated for the return of Amenhotep's eye - Switzerland agreed without condition. 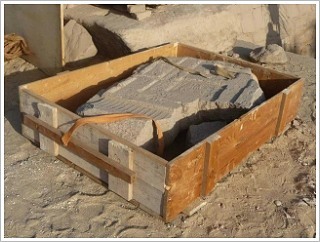 That is how it came that it returned to Egypt in 2008. However, it took 4 years more until it was brought from Cairo to Luxor. But good things come to those who wait... Now the eye just needs to find its original place in the face of Amenhotep III's statue. On Sunday February 10, 2013 (among others) Diana Craig Patch from the Metropolitan Museum of Art in New York will lecture on the ongoing works at the north village and palace of Malqata. Amenhotep III established the site in the 30th year of his reign (about 1360 BC) when he celebrated his first heb-sed. Malqata is located at the Theban necropolis on the edge of the desert south of Medinet Habu. Diana Craig Patch is a member of The Joint Expedition to Malqata (JEM), a team of experts in Egyptology and survey, which she is directing together with Dr. Peter Lacovara from the Michael C. Carlos Museum in Atlanta, Georgia. She is the author of the catalogue "Dawn of Egyptian Art", an awesome exhibition of the MET in the past year. Her lecture at the Mummification Museum will start at 7 pm. From the 30th dynasty on it served as a pavement at the rear chapel of the Khonsu Temple at Karnak. 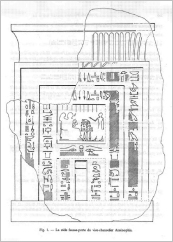 After its discovery - broken in eleven fragments - it has been dug out and stored ( Claude Traunecker: La stèle fausse-porte du vice-chancelier Aménophis, Cahiers de Karnak, 1980, 6, 197-208). Later, further fragments were found, which could complete the restoration. 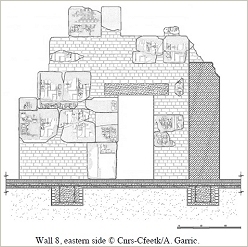 In 2009, the Archaeological Mission in the Theban Necropolis (MANT) of the Université Libre de Bruxelles and Université de Liège discovered the original location of the false-door. It belonged to the lost tomb of Amenhotep, deputy of the overseer of seal-bearers, and his wife Renena (TT C3), located on the south hillside of Sheikh Abd el-Qurna. This morning the Centre Franco-Égyptien d'Étude des Temples de Karnak (CFEETK) announced that the stela is back to Sheikh Abd el-Qurna and will soon be brought to its original location in the tomb. 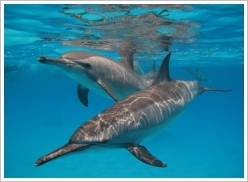 The horseshoe-shaped dive site Sha'ab Samadai (“Dolphin House”) is because of its resident spinner dolphins (Stenella longirostris) one of the main attractions of Marsa 'Alam. The dolphin's name is caused by its acrobatic displays in which it spins along its longitudinal axis as it leaps through the air. As of 2013 the site is under mangement of environmental protection organisation HEPCA (Hurghada Environmental Protection and Conservation Association). Already in 2004, HEPCA mobilised the responsible governor to designate Samadai as protected area. The then fee-based access to the area had been limited to 200 visitors (divers/snorkellers) a day. A management plan was developped. However, HEPCA still received numerous complaints and reports from dive centers about irresponsible practices still taking place. No surprise because of lacking information for adequate behaviour. 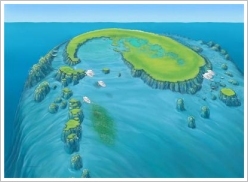 Now, HEPCA will amend it with a campaign over the coming weeks, which aims to raise awareness of the population for the unique place of Samadai. Every Friday, HEPCA will be offering free excursions to Samadai for school children and local residents. A free 8-hour certification program will be provided for dive and tour guides. Dolphin specialists will be on-site to engage visitors and provide information. HEPCA will also be creating a new web-site and broadcast underwater streaming video via live web-cam. Any boat radio will be allowed to be tuned into a special radio frequency in order to hear the dolphins. A fully equipped "bio boat" will be deployed at the site providing hands on interactive learning for students and visitors alike. Scientific research will be continued in order to make informed decisions about the future management. A monitoring program will be re-established. All these steps were not only taken for protection of the dolphins but also in order to give added value to this tourist attraction and provide a much more memorable and fulfilling experience of this amazing site. We make available HEPCA's 23-page richly illustrated guide with comprehensive information on Samadai, the spinner dolphins and excursion programs. Download here ( . 4,53 MB). Maybe you would have liked to visit the concert of classic Arabic music by Hamada and his musicians but has been prevented for any reason? 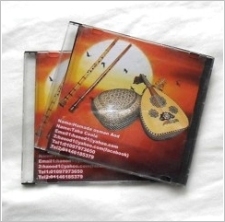 You really missed a great event but you can get Hamadas CD (50 LE) via us. While stocks last. 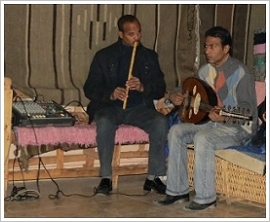 Or you book Hamada and his colleagues for your own event: Hamada: 011 461 853 79.